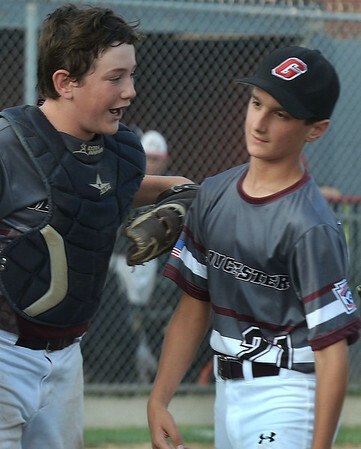 Gloucester defeated North Andover 4-2 in Section Four Little League Tournament on Friday. CARL RUSSO/Staff photo. Gloucester's catcher, Max Viera congratulates relief pitcher Drew Macchi after winning the game. Gloucester defeated North Andover 4-2 in Section Four Little League Tournament on Friday. 7/20/2017.